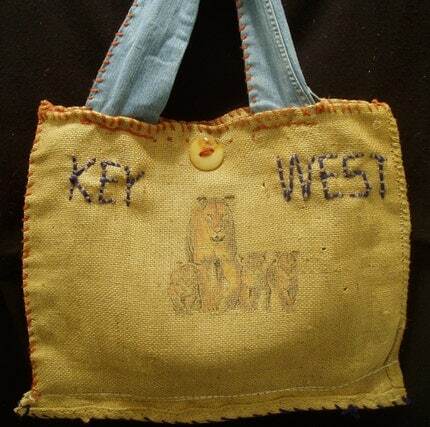 Burlap Bags For sale,used burlap bags call 813 770 4794. We are a small reuse company, please support reuse. 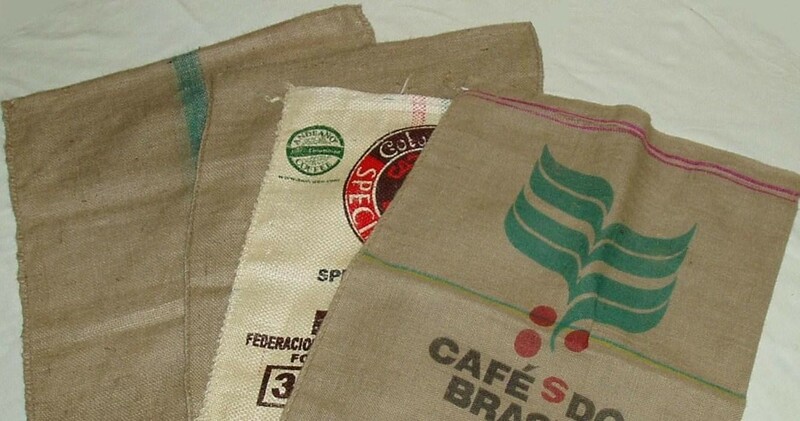 Burlap bags has many uses including, agricultural and industrial products,Balling roots and earth when planting trees and shrubs.Burlap bags can be used for frost protection,wind breaks for plants.Burlap bags also for ground cover to prevent erosion and to promote seed germination. Great covers for cement during curing,and balling bags for trees. Handbags made from reuse Coffee Burlap Bags. 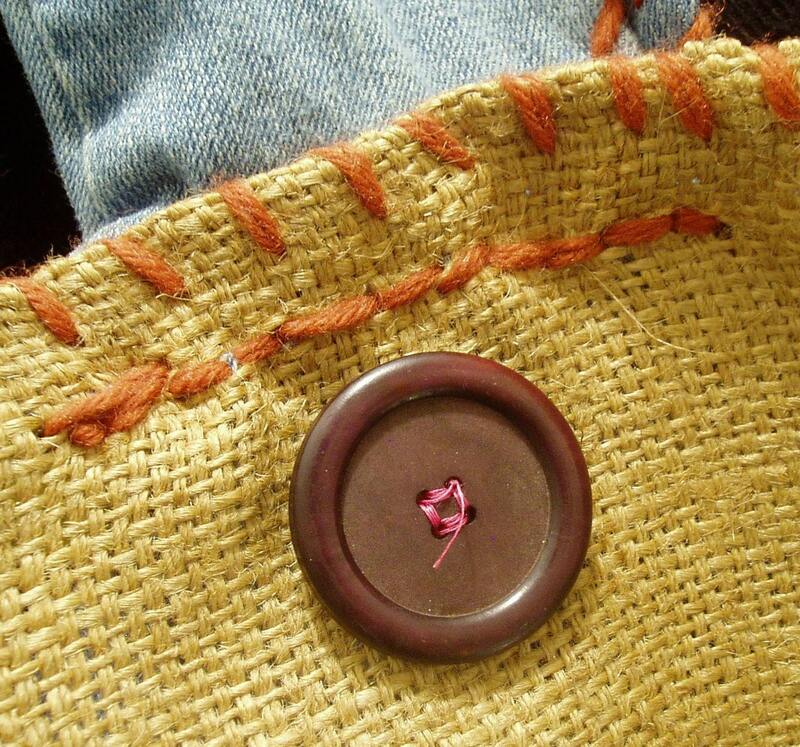 Artist in reuse in Handmade Handbags.The Handmade Handbags making a true green statement. 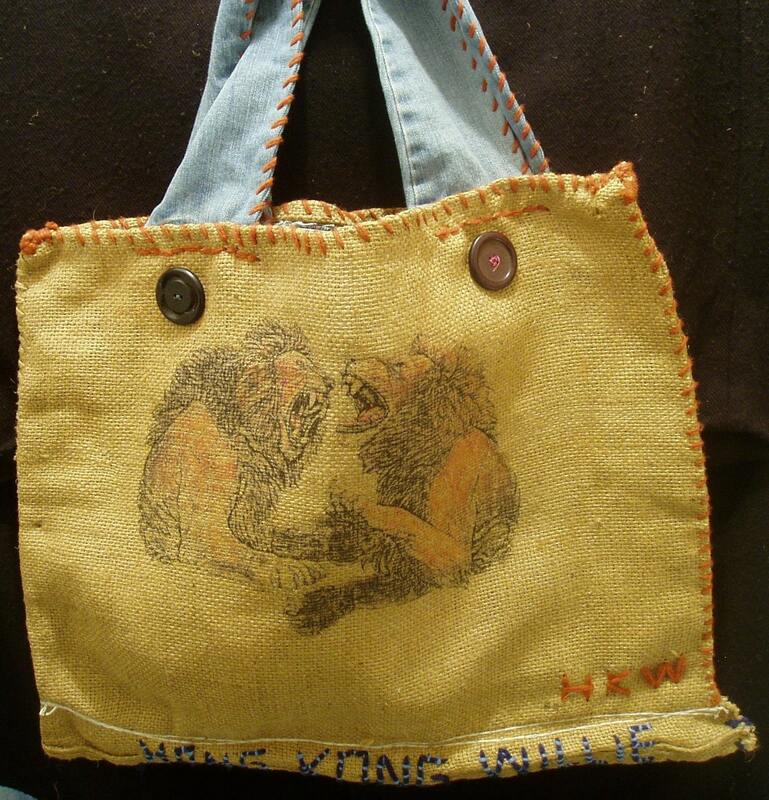 Coffee Burlap Bags that have a fashion of a hip style.Hong Kong Willie Coffee Burlap Bags are a one of a kind handbag that will be a handbag for this time or a Handbag that you will have the rest or your life. TAMPA, Fla. – Have you ever seen the building on the corner of Fletcher and I-75 with a bunch of buoys strung everywhere? 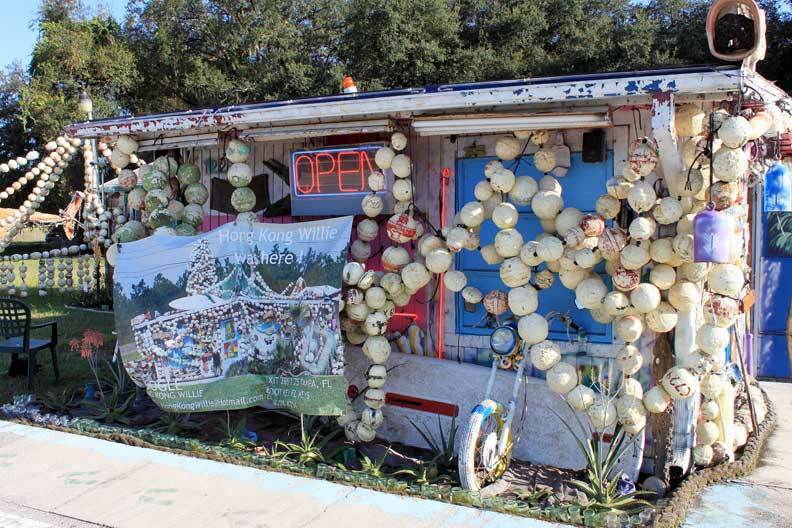 This small business that many think is an old bait n’ tackle shop is actually Hong Kong Willie. Derek Brown, 26, and his family own and operate Hong Kong Willie. The little shop specializes in preservation art. The artists don’t take preservation too lightly either. Just as unique as the art is, so is the company’s name. Brown says the name was created by his father, Joe Brown, in the 1950s. Brown’s father then took that concept and later added the Americanized name Willie to the end. And that’s how Hong Kong Willie was born as a location that offers recycling in a different and creative way. 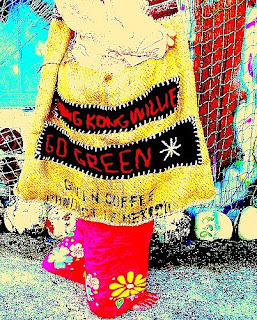 Hong Kong Willie artists are what are known as freegans. Freegans are less concerned with materialistic things and more concerned about reducing consumption to lessen the footprint humans leave on this planet. Brown and his family carry this practice through to their art. 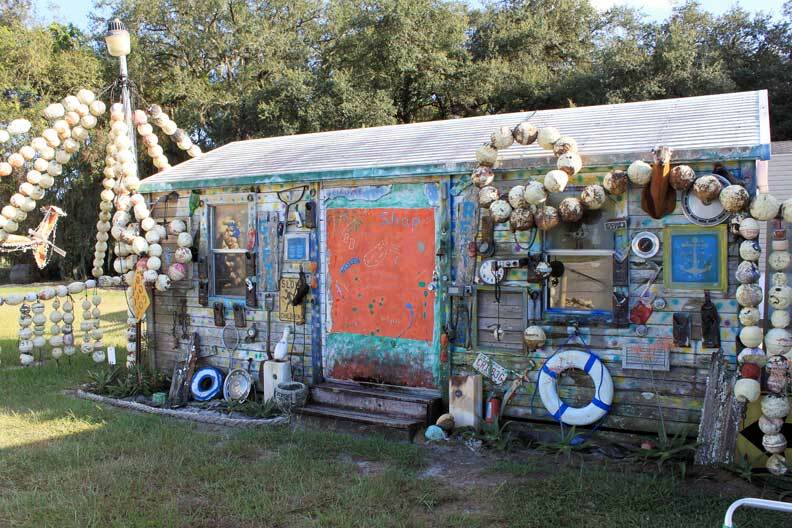 It’s his family’s way of life, turning trash, which would otherwise fill up landfills, into an art form. 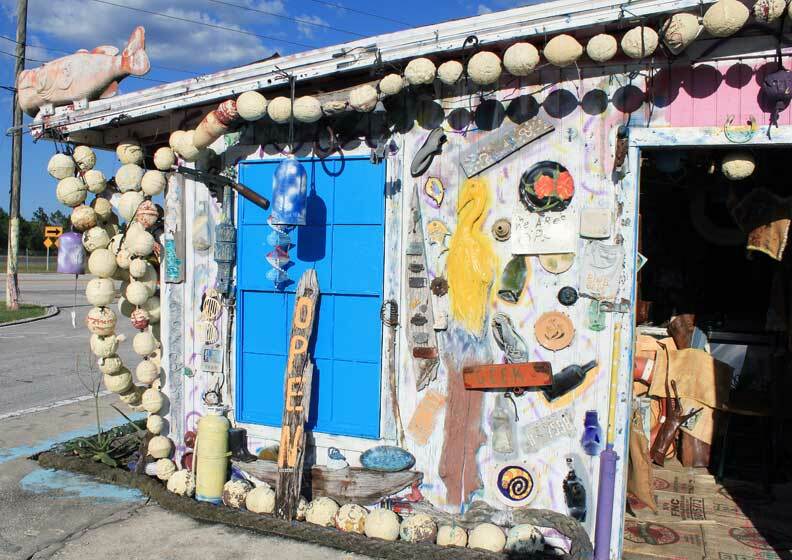 The Brown family gets a lot of their inspiration for their art from the Florida Keys. 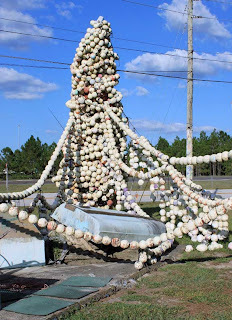 In fact, this is where the deluge of buoys wrapping around the ‘Buoys Tree’ came from, the fishermen of Key West. 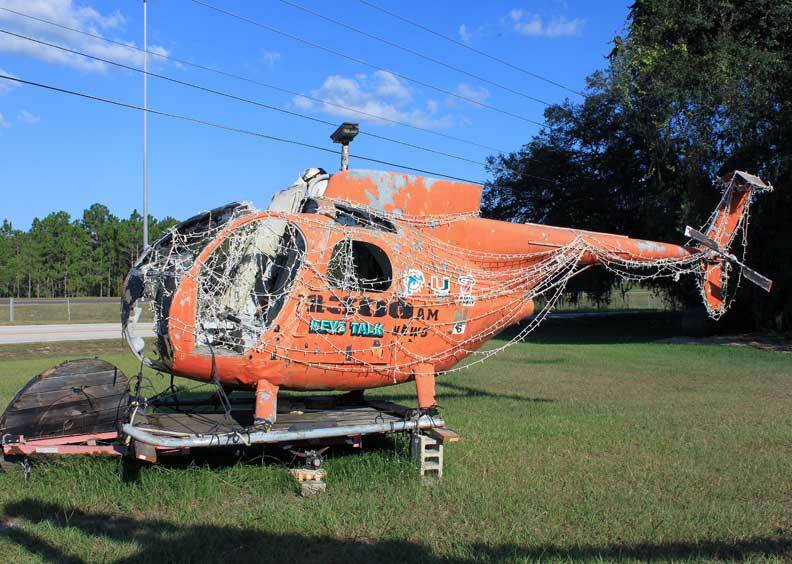 “It is Styrofoam, we understand that it does not degrade, but to blame the fishermen for their livelihood wouldn’t be correct, instead we find a usage for those,” Brown said. 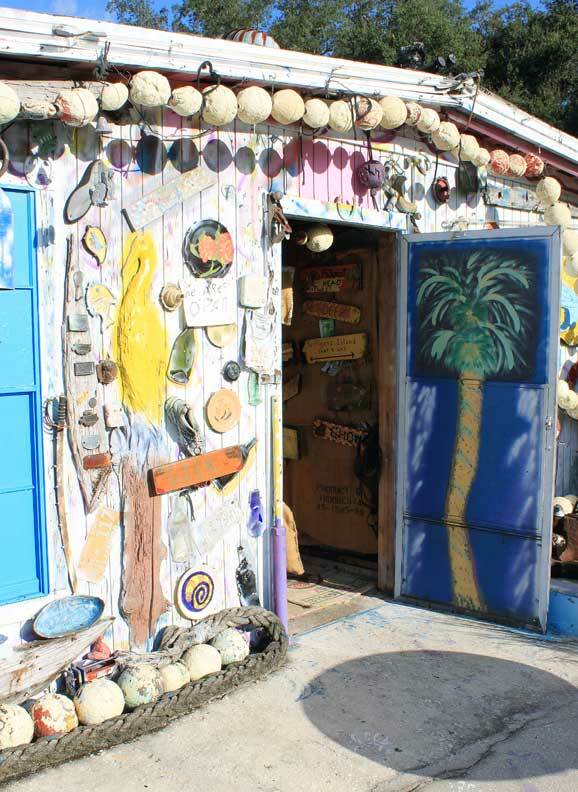 Brown said there’s a usage for everything, even the hooks to hold the painted driftwood, which are also salvaged, to the wall are old bent forks. Everything’s reused here. 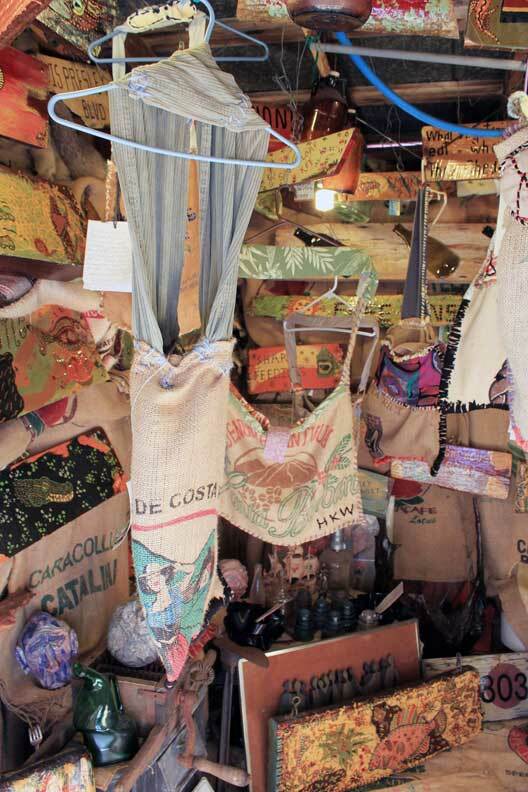 Purses made out of old coffee bean sacks to “kitschy,” as Brown described it, jewelry made from old baseballs. Folk artist Joe Brown, better known as “Hong Kong Willie,” makes art with a message at his home/studio near I-75 Exit 266 Tampa Florida. While attending an art class in 1958 at the age of 8, Tampa folk artist Joe Brown recalled being mesmerized by the lesson. It involved transforming a Gerber baby bottle into a piece of art. By the time class was over, Brown learned many other lessons, too, such as the importance of volunteerism, recycling, reuse and giving back to the community. He recalled being impressed by the teacher’s volunteer work in Hiroshima, Japan, helping atomic bomb survivors. “One of the last words she ever spoke to me about that was, ‘When I left, I left out of Hong Kong,’ ” he said. After turning that over in his young brain for awhile, he decided to use it in a nickname, adding the name “Willie” a year later. 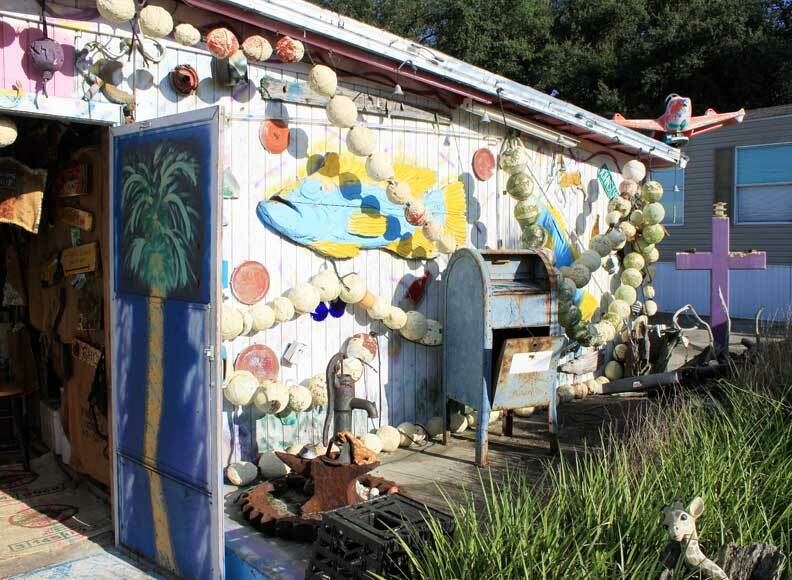 You’ve probably seen Hong Kong Willie’s eye-catching home/gallery/studio at Fletcher Avenue and Interstate 75. 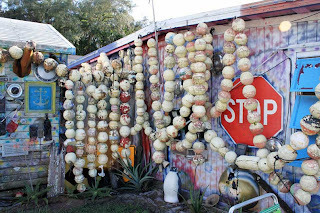 But what is the story of the man behind all those buoys and discarded objects turned into art? Brown practiced his creative skills through his younger years. But as an adult, he managed to amass a small fortune working in the materials management industry. By the the ’80s, he left the business world and decided to concentrate on his art. He spent some years in the Florida Keys honing his craft and building his reputation as a folk artist. He also bought some land in Tampa near Morris Bridge Road and Fletcher Avenue where he and his family still call home. Brown purchased the land just after the entrances and exits to I-75 were built. He said he was once offered more than $1 million for the land by a restaurant. He turned it down, he said, preferring instead to make part of the property into a studio and gallery for the creations he and his family put together. 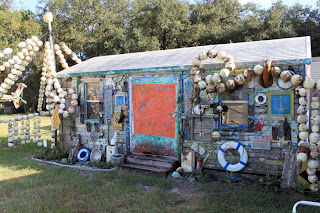 And all of it is made of what most people would consider “trash.” Pieces of driftwood, burlap bags, doll heads, rope — anything that comes Brown’s way becomes part of his vocabulary of expression, and, in turn, becomes something else, which makes a tour of his property somewhat of a visual adventure. What at first seems like a random menagerie of glass, driftwood and pottery suddenly comes together in one’s brain to form something completely different. One moment nothing, the next a powerful statement about 9/11. 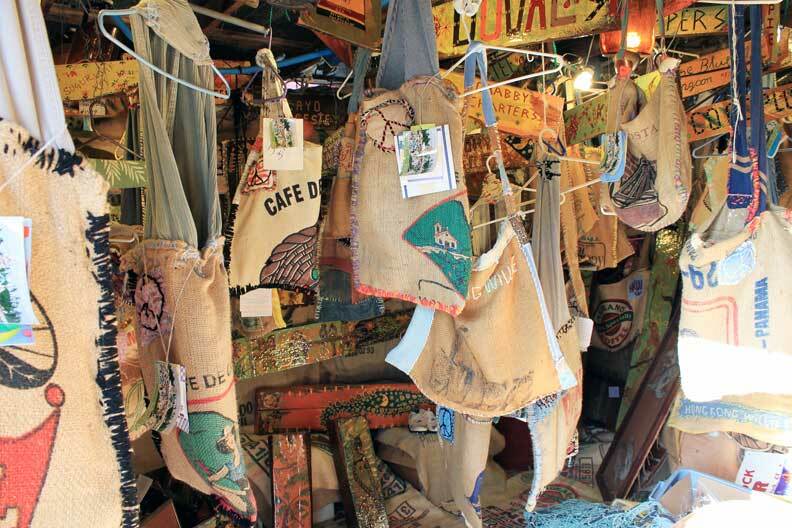 In his shop, he has fashioned many smaller items out of driftwood, burlap bags and other materials into signs, purses, totes, bird feeder hangars and yard sculptures. 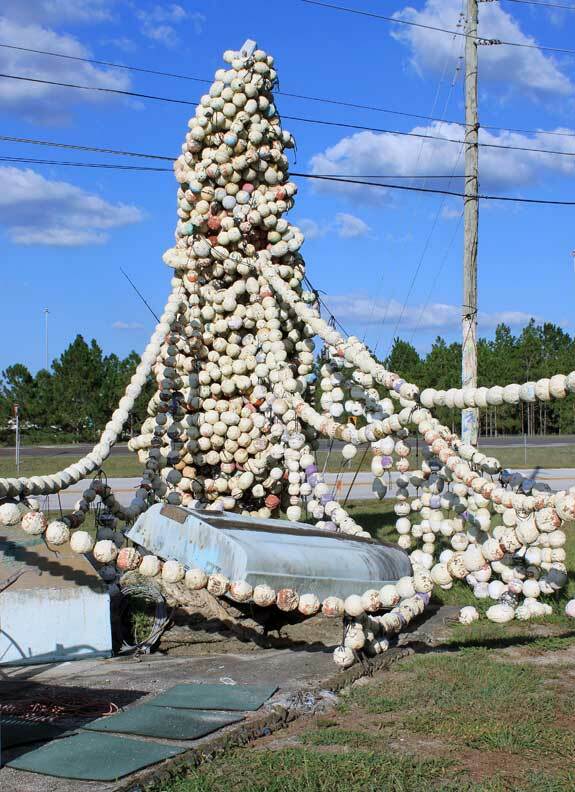 He sells a lot to the regular influx of University of South Florida parents and students every year who are are at first intrigued by the “buoy tree” and the odd-looking building they see as they take Exit 266 off I-75. If there’s one thing that Brown knows does well in the ground, it’s the Florida redworm, something he enthusiastically promotes, selling the indigenous species to customers for use in their compost piles. Some of his customers say his worms are just as good at the end of a fishing hook, though. 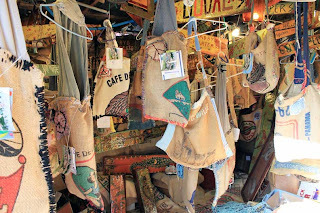 Of course, many people also stop by to buy the smaller pieces of art that he and his family create: purses made of burlap, welcome signs made of driftwood, planters and other items lining the walls of his store. Owner Jimmy Ciaccio said that when it came time to redecorate the restaurant several years ago, there was only one person to call for the assignment, and that was his good friend Brown. Ciaccio says he still gets compliments all the time for the restaurant’s atmosphere he created using the “trash” supplied by Brown. 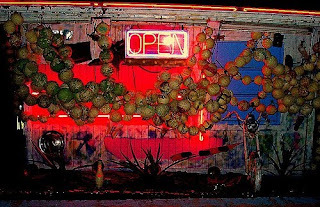 He describes the style as a day at the beach, like a visit to Old Key West. “They’re so inspired, they want to decorate their own homes this way,” he said. It’s that kind of testimony that makes Brown feel good, knowing that others, too, are inspired to create instead of throw away when they see his work. He simply lets his work speak for itself. Brown, who is now 60, makes art from trash at hisHong Kong Willie Art Gallery. 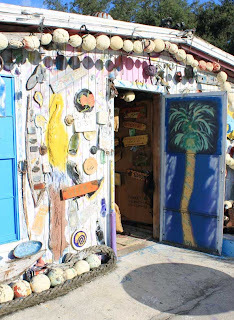 He has embellished the outside of the gallery with splashes of Caribbean-color paint and found objects reminiscent of Key West. 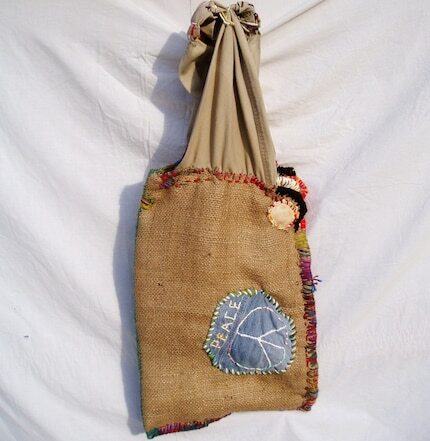 This entry was posted in burlap handbags, coffee burlap bags, Coffee Burlap Bags etsy, Etsy Burlap Handbags, etsy handbags, hong+ kong +willie and tagged COFFEE BURLAP BAGS. Bookmark the permalink.